Ever been constrained by superstitious people, particularly old folks in an important family event? Here's a list of do's and don't, traditions and superstitions on death, wake and funerals in the Philippines compiled by Tutubi based on his own observations and experiences. Bawal Maglinis: Sweep/clean the house only after the burial. But you're excused if the wake is held in a chapel/funeral home. Bawal mag-uwi ng pagkain: No "take home" of food and drinks served at the wake. Probably more of a practical prohibition, Tutubi at one time unknowingly took home a cupcake from a wake he attended. No bad consequence happened to him. Babies and children are made to cross over the coffin of the dead and back again lest the dead departed will come to "haunt" them. Talk about a good man turned evil when dead. Tutubi prefers his baby to be visited by his dead grandfather for them to bond, spend time together and watch over Tutubi, Jr.
Tutubi, Jr. passed over his grandfather's coffin. Note that Tutubi has only two memories of his paternal grandfather and one of them was the time he was lifted over the casket of his dead grandpa when he was four years old. Sadly, 6 month old Tutubi, Jr. will not have a memory imprint of his grandpa. Walang libing ng Byernes (No burial on Friday): this is new to Tutubi, he only knew about the no burial on Monday simply because it's the priests' day-off but not this one. This was the main reason why his daddy's interment was moved from Friday to Saturday. Expect flowers from politicians with huge ribbons emblazoned with their names. Funerals are visited by many people and so make them effective marketing campaign exercise besides their usual waste-of-public-funds street signs and tarpaulins hanging here and there. Expect also the politicians' names written in large, noticeable writing on the visitor logbook for added "pogi points" to whoseoever care and dare to review the visitor log. Since next elections are nearing, a city councilor from district 4 visited the wake at St. Peter Chapels, located in QC District 1. It's because she's reportedly eyeing the vice-mayoralty of Quezon City. Hagad or police escorts will direct/halt traffic flow on the funeral route from the funeral home/chapel, pass by the home of the departed, then proceed to the resting place (Manila Memorial Park Holy Cross near Quirino Highway, Novaliches, Quezon City). The police escorts are, again, courtesy of a politician in addition to providing a van/vehicle to be used by the family. 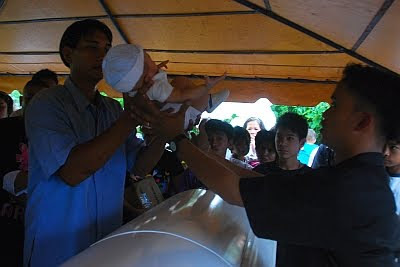 How do Filipinos bury their dead? The most common you can find in cemeteries are above-ground niches with white crosses with letters SLN or RIP inscribed on them plus the name, birth and date of death of the departed. Epitaphs are not popular. Burying 6 feet underground is uncommon except in pricey cemeteries. Columbariums to hold ashes of cremated dead are also gaining popularity. During the funeral, what used to be black attire of family and friends is now white. In Tutubi's hometown in Paete, Laguna, he witnessed a handful of soil placed inside his grandmother's coffin for reasons unknown to him. Flowers, usually roses are thrown at the casket being lowered or before the niche is sealed. 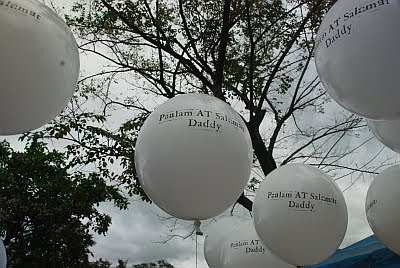 White balloons are sometimes released after the burial by family and friends of the departed. Pasiyam (Nine days): traditional nine days of prayers offered for the departed. This is confusing. Tutubi knows the counting starts on the death death, some people offering the prayers aver the day is reckoned from the first day when mass was offered; others say counting starts the day after the death occurred and still other people argue counting should start on the date of interment/cremation. 40 days traditional mourning observed forty days after the death of loved one. This is not really confusing as the pasiyam since everyone agrees with the date. But why observe the pa-siyam reckoned from a different day? If you were in Tutubi's shoes, what would you do: would you oppose other people imposing their own beliefs on your family of just go with the flow? my family on both sides don't really follow any superstitions on attending wakes/funerals. one time however, it was my titas who scolded me for wearing red at a wake we were attending, maybe because it was a friend's wake. was only ten that time and didn't know about the red issue. but i never wore red again even if i went to a family member's wake. i sincerely hope you and your family are doing all right. I know about the baby crossing the coffin or the grave but the balloons is certainly new to me. realy, politicians do visit the wake? eh may namamatay everyday diba, that should keep them busy all the time! Going against the flow is not easy, I'm afraid. It is difficult to get people to deviate from their beliefs in such matters. Sometimes going with the flow is the easy and comfortable way. Very educational this post, thanks for sharing! I don't think you have to totally go against the flow. When I was in college, I learned that pamahiin may sound impractical but they were actually conceived because of some reasons. When they were handed down to the new generation, nakalimutan sigurong isali ang explanation. Here are some possible (and a bit hilarious) reasons I came up. Bawal mag-uwi ng pagkain: Because the food are for the visitors. Bawal ang pulang damit: Red is too dazzling for mourners. Distracting. Bawal Maglinis: Too dusty for the mourners. how about when a son is sick and the mother has a work colleague that just died? Can the mother go to the wake even if her son is sick at home? If the mother goes to the wake what are the things she should avoid doing before seeing her son at home? Is going to the wake while her son or any immediate family is sick will give them bad luck or cause death later on? anonymous, the mother has a duty to take care of her sick son. I can't offer you more advice as i don't really beleive in superstitions. can someone email me the nine-day prayers for someone's death? please send it to ntdmrd@aol.com. thanks. bakit bawal magahtid ng bisita ?? sa pintuan ng funeral? Question and all answers are welcome. After my lola's burial, there was a cross that was purched up on or near her coffin (throughout the wake and burial) and was handed to my aunt by the priest right after the burial ceremony. It seemed she didn't want it and immediately handed it to my dad because she said he was the eldest. Is there a pamahiin or reason for keeping the cross and is it really okay to keep it. My immediate family is having a conflict on bringing it into the house. My dad asked our church pastor and he said that it is a blessed object of the church, a reminder of our lola and should be good luck to the family. Is this true? I thought we were not suppose to keep anything from the wake and burial? Can someone post any known pamahiin about this? Thanks all. sa wake nang papa ko may crucifix na nilagay ang tita ko den pagkatapos nang burial ceremony ay kinuha ulit nang tita ko at binalik sa altar nila, symbol yon nang god dapat lang i keep..
HI. when my classmate Died we did the "Release the balloon" thingy.. But i just don't get why we need to cross the baby over the coffin? Is it really necessary?